Relevance The GFP-KSC4 Keratinocyte Stem Cell line can be used for the generation of in vitro epidermal ‘skin equivalents’ to be used as screening tools to look at the activity of NCE’s and/or NBE’s of dermatological interest, and/or to screen for such NCE and/or NBE in high throughput systems. It may also be of use to non-pharmaceutical healthcare and/or cosmetic companies involved in the personal vitality and/or beauty product development segments. Murine keratinocyte stem cell line. Production Details Keratinocytes were isolated from neonatal homozygous C57BL/6-Tg(CAG-EGFP)1Osb/J mouse skin. 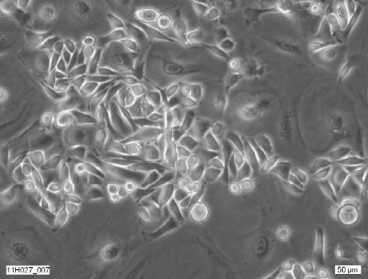 The cell line was established by growing cells for the first 8 passages in co-culture with 3T3-J2 fibroblast feeder cells. From passage 9 onwards cells were grown without feeder cells. Recommended Growing Conditions The cell line grown is low calcium medium, Ham's F12/DMEM with 10% FCS and several supplements at 32°C, 5% CO2. The supplements are: 0.18 mM adenine, 0.5 µg/ml hydrocortisone, 5 µg/ml insulin,10 -10 M cholera toxin, 10 ng/ml EGF, 2 mM glutamine, 1 mM pyruvate, 100 U/ml penicillin, 100 µg/ml streptomycin. Population doubling time is 22 hours. Cells are grown on plastic, coated with collagen I. Cultures are split at confluency 1:2 or 1:3, 2-3 times per week. Vollmers et al. 2012. Stem Cell Rev. 8(2):402-13. PMID: 21892602. Höher et al. 2012. Stem Cell Rev. 8(2):426-34. PMID: 21874280. Highly efficient zinc-finger nuclease-mediated disruption of an eGFP transgene in keratinocyte stem cells without impairment of stem cell properties. Two- and three-dimensional culture of keratinocyte stem and precursor cells derived from primary murine epidermal cultures. Reichelt et al. 2010. Methods Mol Biol. 585:59-69. PMID: 19907996. Establishment of spontaneously immortalized keratinocyte lines from wild-type and mutant mice. Okabe et al. 1997. FEBS Lett. 407(3):313-9. PMID: 9175875. 'Green mice' as a source of ubiquitous green cells.